Shawnee’s Caden Vermillion pitches against Lima Senior during Saturday’s doubleheader at Shawnee. See more doubleheader photos at LimaScores.com. 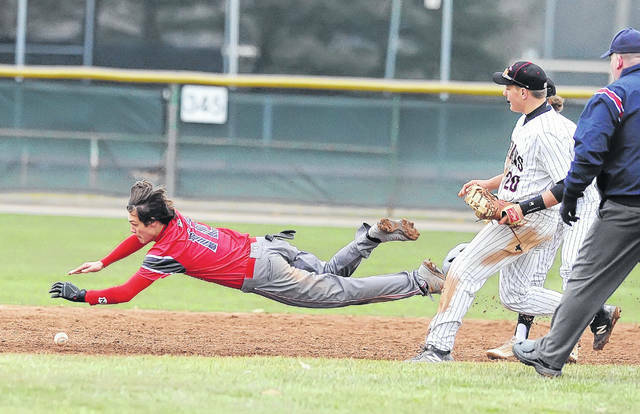 Lima Senior’s Caleb Dugan steals second base against Shawnee during Saturday’s doubleheader at Shawnee. Shawnee’s Logan Maxwell slides safely into home against Lima Senior’s Bryce Binkley during Saturday’s doubleheader at Shawnee. 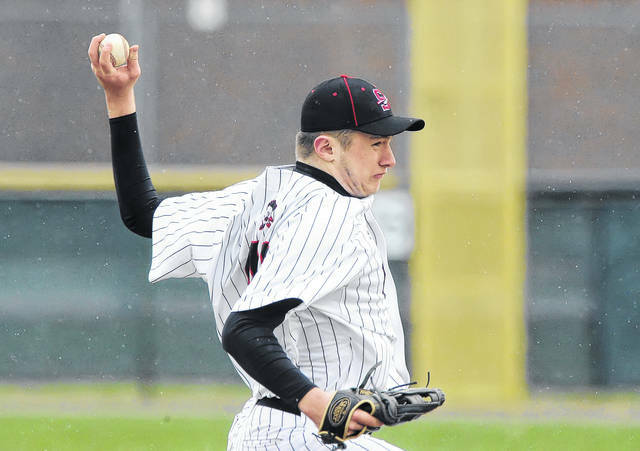 SHAWNEE TOWNSHIP — The idea was to beat the monsoon and give a few pitchers some work. Shawnee did that and more. 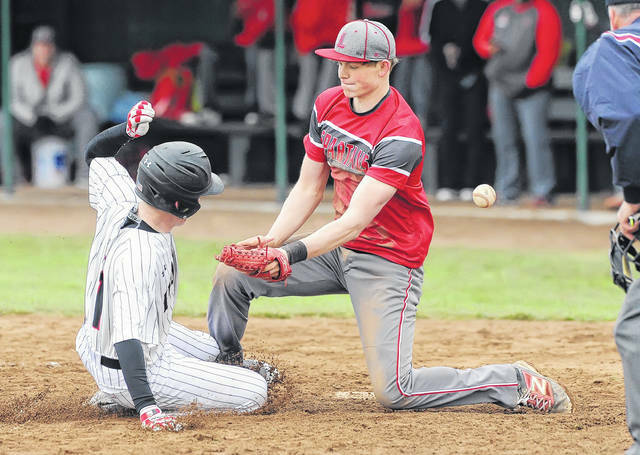 Shawnee swept Lima Senior 9-3, 7-3 in a baseball doubleheader Saturday. Shawnee is 3-1. Lima Senior is 2-4. While the full-out rain didn’t arrive during the games, most of the second game was played in a cold mist. The Indians ended up giving six pitchers work, and one especially stood out. Shawnee freshman left-hander Caden Vermillion pitched in both games, including notching a win in the first game. Vermillion tossed the final 4 1/3 innings in the first game, giving up no runs on one hit. He struck out four and walked three. The 6-foot-4 Vermillion, took a quick break in between games, then took the ball to start the second game. He went 1 2/3 shutout innings in game two. For both games, Vermillion tossed six shutout innings, giving up two hits. He struck out four and walked five. For the day, he threw 85 pitches, 53 for strikes. Vermillion threw his breaking ball and fastball for strikes. “He (Vermillion) showed us a lot,” Shawnee coach Jimmy Morris said. “Coming into the season, we weren’t sure he would pitch for us. But as it turns out, he’ll throw innings for us. He’s got some tools and is a big, tall left-hander. Lima Senior left-hander James Gaines started the opener and deserved a lot better. The Spartans made six errors at costly times behind him and he gave up only two earned runs. He went 5 1/3 innings and gave up nine runs, two earned, on six hits. He struck out eight and walked eight. Gaines threw 121 pitches (for under the state limit of 125), 70 for strikes. He threw plenty of breaking balls for strikes. Shawnee scored four in the home fourth to take the lead to stay 6-3 in the opener. Jared Thomas’ sacrifice fly to left made it 4-3. For Shawnee, Jake Hutchins went 2 for 2 with two walks and an RBI. Garrett Shaw went 1 for 4 with a double and an RBI. Hutchins went 2 for 2 with a walk in the second game. That gave him a 4 for 4 day. In the second game, Hutchins’ RBI double in the first gave Shawnee the lead to stay 1-0. Shawnee right fielder Logan Maxwell made a run-saving, diving catch in right with the bases loaded and two out in the top of the fourth off the bat of the Spartans’ Adrian Bowsher. That got Shawnee out of the inning and kept the Indians on top 4-3. Thomas went 2 for 3 in the second game. Kale Ebling was 1 for 2 with two RBI. For the Spartans in the second game, Caleb Dixon and Bowsher both went 2 for 4. Lefty Jeff Hunt picked up the win in the second game. He went 3 2/3 innings, giving up three runs, all earned, on five hits. After Hunt, Justin Behnke, A.J. Brown and Thomas all threw a shutout inning for the Indians. This entry was tagged limasenior, shawnee. Bookmark the permalink.